This obituary has been written by the Essex Badger Protection Group, and they have kindly given permission to share it to the Benfleet Community Archive site. ‘Our dear colleague and friend Don Hunford passed away on Friday 3rd August 2018. He was one of the most knowledgeable people in the UK on badgers and will be greatly missed. Don Hunford was born on the 19th May 1925 in Essex. He later moved to the Cotswolds, where he taught maths and physics in a school near Cirencester. He started watching badgers back in the 1950s whilst teaching in Gloucestershire and was inspired by one of the first badger enthusiasts, Ernest Neal. He gained a tremendous knowledge of badgers, based on years of careful study and observation. His work brought him back to Essex in 1954, and it was at this time he started surveying Essex badger setts. He deliberately chose to live at his house in Thundersley, because he knew that the surrounding woods held badgers. It was there that he set up a hide so that he could observe the badgers at close quarters, and he kept detailed records about them. He became very close to his badgers and gave all of them names and was able to identify them by sight. They would follow him around his woodlands, up to his house, and he often fed them straight from his hands. Regularly he would invite other badger enthusiasts around to observe the badgers from his hide. These were always magical evenings where you would often see as many as fourteen, or maybe even more, badgers playing and feeding together next to the hide sometimes very early in the evening in broad daylight. Over the years, Don has travelled around many parts of the world, including Europe, Africa and India, to study badgers and other wildlife. In 1959, he became a founder member of the Essex Wildlife Trust. He remained a director there until he resigned in 2004. 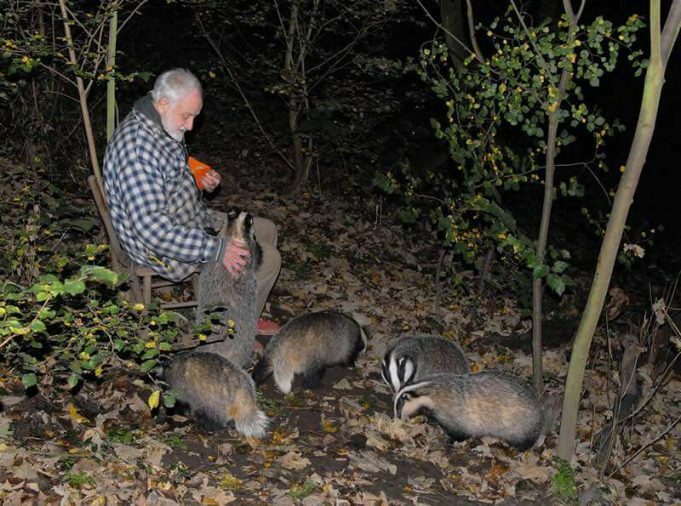 Don went on to become one of the UK’s most respected badger experts. He has featured on television programmes about badgers, including Springwatch and the Badger Night Live broadcasts in 2009. In 2015 he gave a highly moving speech at the Badger Trust Conference. This was possibly his last ever public speech. Sadly, Don lost his sister in 2016. This affected him badly and led to his deterioration in health the following year. In January 2018 he had a bad fall at home and was taken to Southend University Hospital. Fortunately, his injuries were not too severe with mainly bruising to his back, but this was not a good thing to have happen at his advanced age. He was later moved to Stafford Hall Nursing Home in Benfleet where he was well looked after. On his birthday on the 19th May 2018 he had another bad fall in the nursing home. Unfortunately the fall left him with a fractured pelvis. He returned to Stafford Hall Nursing Home for a short time but soon his health deteriorated, and on the 3rd August 2018, he was re-admitted to Southend University Hospital, where he passed away peacefully the same morning. Very sad to belatedly hear the news of Don’s passing. A wonderful ambassador for Badgers in the UK and I had the pleasure of visiting him at his home in Benfleet onseveral occassions to watch “his” badgers. he will be sadly missed by all of the badger community. RIP Don.